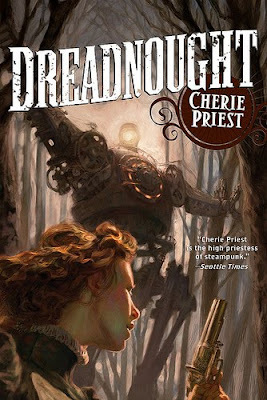 The cover for Dreadnought is done by Jon Foster who did the Boneshaker art as well as the recent final version for Clementine. Great angle and positioning. How can I not love a gun-wielding heroine facing down a giant robot? I can't. Not one whit. Dreadnought will be released this October from Tor with at least two more volumes in the series to look forward to. Mercy Lynch is elbows deep in bloody laundry at the Robertson Hospital in Richmond, Virginia, when Clara Barton comes bearing bad news. In her hand she holds a terrible document called the Atwater List, and on this list is the name of a union soldier who’s been missing for months. And just like that, the young nurse is no longer a nervous newlywed, waiting for news of her absent husband. Now she is a widow, and the bad news doesn’t stop there. A second message—a telegram from the west coast—declares that her father is badly injured, possibly dying, and that he wishes to see her. So Mercy sets out west, through war-torn border states on a trek to reach the Mississippi River. On the other side, she’ll catch a train over the Rockies and—if the telegram can be believed—she’ll be greeted in Tacoma, Washington, by a law officer who will take her up to Seattle to see her father. Of course, it’s not that easy. Getting to the Mississippi is trial enough, and once Mercy reaches St. Louis, the only Tacoma-bound train is pulled by a terrifying engine known as the Dreadnought. Heavily armed and thickly armored from cow-catcher to hitch, the Dreadnought is more commonly deployed in the eastern war frontier, running supplies and artillery reinforcements along the Mason-Dixon to refresh Union forces. Now, the magnificent war machine seems to towing deceased soldiers back to their homes in the west, for burial. But out past the river, on the plains, and up in the mountains, things are rarely precisely what they look like on the surface; and the Dreadnought’s mission is no exception. Looks pretty good to me, though I have yet to read Boneshaker which has an equally impressive book cover. The cover page looks quite attractive. I think book is good but I believe that good cover page doesn't mean to be a good book so I am looking forward to it's review.